The 72.54 metre motor yacht Coral Ocean has been listed for sale by Moran Yacht & Ship. Built in Germany by Lürssen to a design by the late John Bannenberg and launched in 1994 bearing the name Coral Island, this steel-hulled displacement yacht completed a major refit in 2016 and went on to steal the show as one of the biggest yachts on display at the prestigious Monaco Yacht Show. Lloyd’s compliant, her 1,379GT interior can accommodate up to 12 guests split across six staterooms, including an upper deck master suite offering spectacular forward-facing views. What’s more, the crew quarters on this yacht for sale are suitable for a staff of up to 19 people. Her impressive on board leisure and entertainment facilities include a gymnasium, beach club and spa, complete with mosaic-lined sauna, while the main deck dining area is capable of hosting parties of up to 80 guests. The split-level sundeck is another key feature, with its extensive seating options, bar area and spa pool. Moving inside and a neutral palette of creams and browns creates a calming interior ambience. Power comes from a pair of 1,947hp Caterpillar 3516 engines for a top speed of 17 knots. When trimmed back to 14 knots, she boasts a globetrotting range of 6,000 nautical miles. 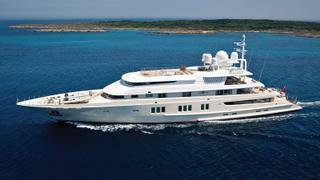 Currently cruising in the Bahamas, Coral Ocean is asking €31,950,000.